Forerib of beef, topside, silverside, aitch bone, rump, fillet steak, hip bone, sirloin, tailend, braising and stewing steak. 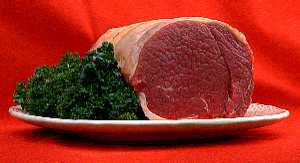 Our beef is currently sourced from Staffordshire, so you know its high quality. All of the animals are born and raised to the highest standards of welfare. Because all of the animals are locally reared, we are able to ensure complete traceability. All of our pork comes from a selection of farms in the Shropshire area, the pigs are well looked after and the farming methods range from indoor bred (kept indoors in spacious straw filled barns) to outdoor bred (kept outside for the first 6 weeks before being moved to the straw barns). Try locally sourced Shropshire pork today and you will never buy foreign again! All our lamb bears the symbol of the Stafford Knot, the use of which was granted by Lord Stafford himself to two farmers; Andrew Wright of Tixall and Roger Swift who raises his animals in Weston Park and surrounding areas. Working closely with Andrew an d Roger has given us the opportunity to offer spring lamb six weeks earlier than normal and provide high quality, locally sourced lamb all year round. All our lambs are hand picked for good conformation and quality by the farmers themselves. As traceablity and local sourcing are becoming paramount in today's society, we at Michael Kirk are proud to be able to guarantee both. Dry salted and prepared using age old traditional methods right here on the premises! The kind of bacon that your Granny would have enjoyed. Fantastic in a full english to the humble bacon butty; taste our bacon and you'll never buy pre-packed again! Michael Kirk offers a wide selection of meats and produce. We are big on taste and tradition, and take pride in providing foods that have been carefully prepared using the traditional methods.